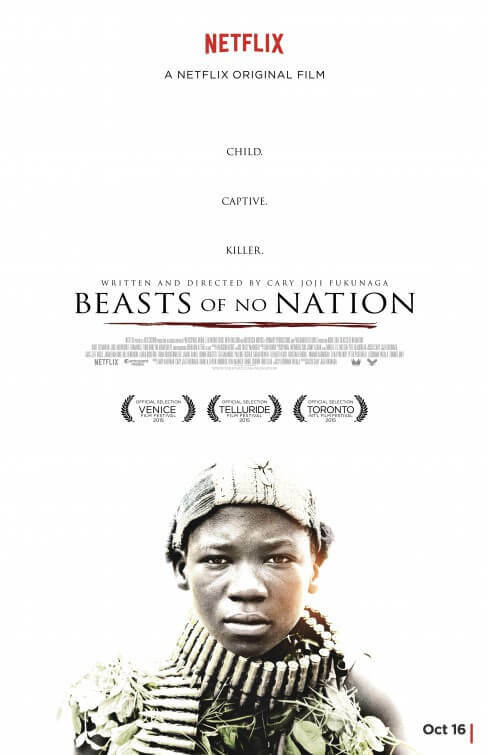 With the refugee crisis dominating headlines at the moment, the time couldn’t be more opportune for a film like Beasts of No Nation to debut and make an impact with viewers. Crises in Syria, Iraq, and in this case parts of Africa are forcing residents caught in the crossfire out of their native homeland and spreading across the world in search of asylum, and with his latest film writer-director Cary Joji Fukunaga highlights the devastation of war-torn continents and, more specifically, the effect it has on those who matter the most: the children of conflict. One such child is nine-year-old Agu (Abraham Attah), whose family is brutally slaughtered by rebel soldiers and soon runs into a militia of child soldiers, led by their fierce Commandant (Idris Elba). Agu is taken in by the charismatic mercenary, and is slowly indoctrinated into a child soldier himself, being repeatedly forced to make extreme decisions to please his leader. The film is a harrowing watch based on its subject matter alone, and Fukunaga has made the bold decision to not shy away from the more extreme measures of violence and loss of innocence. These themes are not entirely new to Fukunaga, whose 2009 debut film Sin Nombre was a fascinating mix of immigration drama and gangster thriller, while his 2011 adaptation of Jane Eyre portrayed a unique vision of the perspective of its youthful main character (the filmmaker was also, until recently, attached to make a new version of Stephen King’s It, which also explores similar themes of childhood and its sacrifice in the wake of sinister reality). However, the way he portrays these themes in this film is far more uncompromising and unnerving, especially because a lot of them involve actual children being forced to do the most horrific things in the name of an extremely persuasive line of order. Its slow pace allows us to absorb every aspect of the nightmarish conditions its inhabitants live in, constantly living in fear of being massacred or meeting death right around the corner; it is almost literally a war zone. Young Agu is quick to learn the ways of his Commandant’s young army, and it is frightening that he takes to it all so fast, as he initially sees it more as a survival mechanism rather than a way of fighting fire with fire. Fukunaga manages to show how easy it is for children in as dire situations as this to fall in with the wrong crowd, but also play it as a children’s cautionary tale that happens to be made for adults; death reigns supreme, as does manipulation and – in one uncomfortable implied scene – sexual assault, and it’s all at the expense of this child’s soul. The performances of Elba and young newcomer Attah are nothing short of powerful, with the latter tackling some of the more disturbing and distressing scenes with an unusually mature and controlled nature, and at a fairly young age as well. Elba, who has yet to be given the chance to carry a film single-handedly, makes a strong case for just that here, and transforms what could have been a one-dimensional character into someone with much more prominent shades of humanity, and is a startling presence because of it. The rawness of the film is what should truly be commended, however; it is a haunting and, quite literally in one sequence, hallucinatory account of what it means to be a child in a war-torn environment, where there is room for everything except, crucially, the opportunity to be a child at all. It is unimaginable what these conditions can do to a child, but Fukunaga is brave enough to paint us a picture of how distressing it can be, without sugar-coating a single frame for the better of the audience. 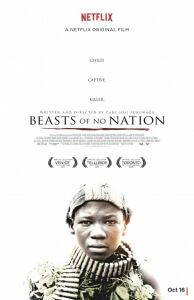 It is certainly a tough film to stomach, but we recommend attempting to do so anyway because Beasts of No Nation is a truly gripping and suspenseful movie that never shies away from the truth of how rotten parts of the world can be at the moment.